I primarily got the Hoka ATR 4 in hopes that I would find a trail running shoe that would give me some of the knee/back forgiveness that seems to be at the core of Hoka’s fame. After the first session on them I am really digging them. I had to resort to the treadmill for my run due to all the snow on the trails right now, but I think that might actually be a better cushion test than a trail run since I seem to have a heavier strike on treadies over natural surface. I noticeably felt like my body took on a bit less stress and I came away with a smile. As someone cautiously making my way back into running with normally aggravated responses post-runs, I was stoked to find what might be just what the doctor ordered to keep me rolling! A great interview with Lisa Hope Tilstra discussing triathlon, paragliding, training, and some deep and honest explorations into life’s trials, triumphs, and the intersectionality with sport. 7 public marathons in seven days on seven continents + 50 public marathons in every US state in less than a year? Possible Guiness record setter? Ultra-distance runner? Ironman triathlete/coach? Successful kicker of a decades-long nicotine addiction? Motivational speaker? All in a day’s work for Dave Jones of Eternal Endurance with whom we had the pleasure of speaking for the site’s first podcast. The audio quality on our side of the recorded call was total crap unfortunately, and there were many lessons learned for podcasting, but we won’t let that stop the inspiration of Dave coming through loud and clear. Word of caution – if you’ve been making any excuses about why you “can’t” lately, and want to keep using those excuses, don’t listen to this. What a Way to Celebrate 40! Josh Hageman joined The Arthritic Athlete community a couple days ago with the milestone of his 40th birthday. One of his ways to celebrate was to go get a little dizzy by running 40 miles on a local high school track. That’s right – 160 laps. Awesomely insane! A big Happy Birthday to Josh. Check him out at @j2pointo on Instagram! It seems the Relive app is popping up in convos more and more, so we’re going to give it a shot. In essence, this app allows the user to create a visual representation with topography, imagery, and data of a completed ride, run, hike, etc. We received a Relive link from an athlete and the thing that stood out most to us was the ability to include memorable media at the point in the activity where things occurred. It’s pretty cool to see the exact location along the route where that amazing rock formation was, or photos of the natural spring where the shoes were kicked off and everyone dove in. Relive makes sharing the stories of our events even more rich than what words can do alone. It’s available on both the Google Play Store and the App Store. Check it out and send us some links! If you went through an alt/punk phase back in the late eighties/early-nineties, we highly recommend a revisit to the fIREHOSE album Ragin, Full-On. This is perfectly matched with a 45′ trainer or treadmill session, (hit an interval during “Brave Capitan,” it’s awesome) and the album naturally winds down in tempo and intensity as the cool down part of your workout begins. Pretty sweet. Great blast from the past! 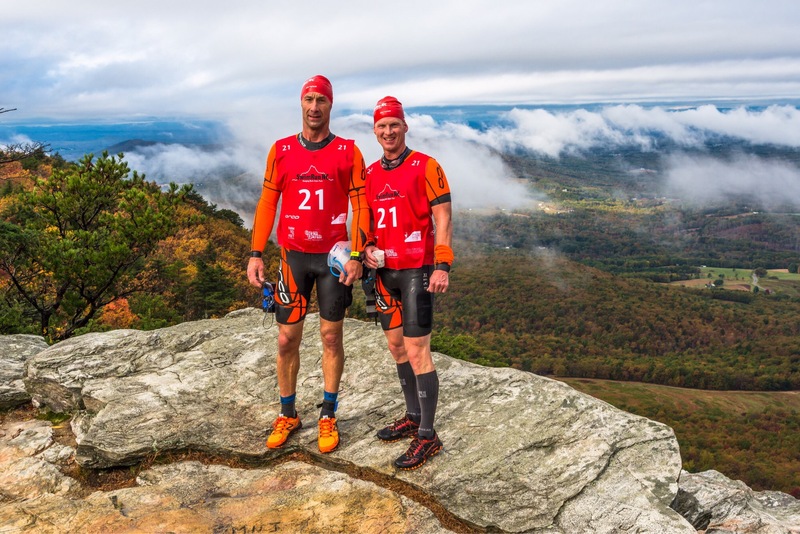 Our friend Matt Barbour was kind enough to give us the low-down on a unique swim/run event that took place at Hanging Rock State Park, NC on Oct 29, 2017. This race was definitely out of the ordinary and has us itching to try it next year! Check out the interview below for the scoop from Matt. AA: Hey Matt! I got an email from you about some crazy race you did last weekend. All I remember is something about 14 miles of running, 2900 meters of swimming, and running through the woods in wetsuits to the surprise of some locals. What the hell was this event?! AA: What was your personal highlight(s) from the race? MB: The race we did was the 2017 Swim/Run North Carolina. About two hours in we fell into a good pace behind Team Persist a mixed female/male team heading up Moore’s Wall, 642 steps up to the highpoint of the race on Moore’s Knob at 2,579 ft. As we steadily climbed I asked the group ahead of us if they had done this type of race before. They politely said “yes” and we discussed some other Swim/Run’s and the differing terrain at other locations. We explained this was our first Swim/Run. We hit the checkpoint at the summit lookout tower, paused for a quick race photo and headed back down still on Team Persist’s heels. A race volunteer directed us to a make a hard right hand turn to stay on course and told us to watch out for the slick rocks and roots to come on the descent. A member of team Persist said thanks but that they knew which way to go and what to expect. As Team Persist lost us on the downhill my teammate Will turns back to me and says “you do know that was Herbert Krabel the race director for this race on team Persist don’t you?” Obviously neither I nor the volunteer recognized him. Herbert personally caught up with us after the finish, congratulated us, and asked how we enjoyed the experience and what we thought of the course. Great course and an even a better group of people racing, hosting and volunteering. AA: Any advice to anyone thinking about doing this? MB: Definitely do some pre-race training sessions with your full kit. This typically involves wetsuits, goggles, swim paddles, modified pull buoys and shoes. Some teams like to use tethers on the swim sections. It’s good to train going back and forth between swimming and running and transitioning all your gear. Most teams use swim paddles. Some simple carry them the whole time while others wear a waist belt and attach them with a carabiner. It’s also good to check for any chaffing issues while running in your wetsuit or with wet shoes. AA: Any local finds (restaurants, pubs, hotels, attractions, nearby parks, etc) that you stumbled on while in the area? AA: What is the website for the event?